Join the discussion on our forums! Come discuss Dark Arakkoa over in our dedicated Dark Arakkoa discussion topic. There's a whole gradient of Arakkoa! This one is on the darker side. People play this without C'Thun, which should be a testament to how good a 5/7 taunt for 6 actually is. That +3/+3 buff to your writhing mass of tentacles and eyeballs is just icing on the cake. but destroy 1 taunt..... maybe if the effect was destroy 2 random taunt minions, then even better. 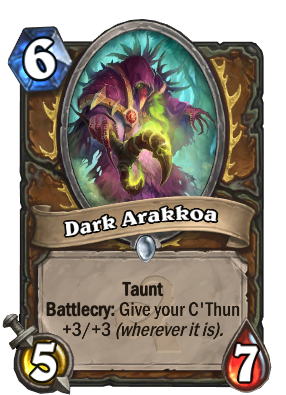 otherwise decks like this druid cthun with powerful taunts is just gonna be wrecking. This. This is the reason to play C'Thun in druid, not Klaxxi Amber-Weaver. Powerhouse 6-drop, insane on turn 5/4 with Innervate/Wild Growth. Curving after Druid of the Claw and Crazed Worshipper and into Twin Emperor Vek'lor / Ancient of War. There has to be a deck insanely powerful to take C'Thun druid spot as the number one deck post rotation. The new auto-include minion for druids, replacing ancient of lore since 26 April 2016. This card should read "Choose one: give your C'THun +3 +3, or gain taunt"
C'Thun decks are seeming to be very playable now. Yeah, it'll deal its final attack damage randomly among all enemies. This card is honestly so good that I think it might see play outside of c'thun decks. I think that having a Boulderfist Ogre that trades 1 atk for taunt is a pretty good deal. I guess Sunwalker already fills the 6 mana taunt slot, but it never seemed to work out for me. I see where you're going with this. 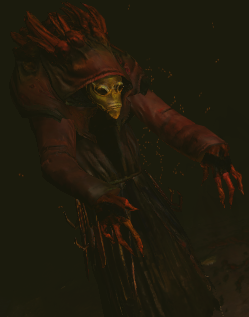 Druid of the Claw sees play hands down with the stats 4/6 for 5 (yes, he also has the charge. Choice cards OP). A follow-up turn where you drop an equally-statted card is pretty strong. I'm really liking some of the new cards coming out for druid. Can't wait to see what people come up with in their new metagame environment. Agreed! It will be nice to see a druid that performs well without needing to rely on its crutchy FoN combo. Here's to a new and reformed druid! Hey Camfourek! I think the comparison you're making is not right. The problem with BrokeBack Combo is not the 14 dmg. It's the possibility to extend this damage by the presence of more minions. If Druid has 1 minion on board, it's 14+2+Minion Atack. That being said, with any minion on board, the Druid can easily do 20+dmg out of nowhere. That's what need to be nerfed. Makes the class unpredictable and tough to play against, because you need to make sure to stay at 14+health and clear the board EVERY TURN. And with the presence of so many sticky minions (shredder, raptor, stealth shade), it's very frustating to play against. As a priest player, it's very common for me vs druid to control the board, at 20+ health, and just because I can't remove a single minion I'm dead. And let's not talk about DOUBLE Savage Roar+FoN, with causes 22 damage, more added by minions. No other class has this damage potential with only 2 cards.